Imagine being plopped on a train platform at ten years old, traveling from St. Louis to New Mexico for two days all by yourself, and anticipating a reunion with your father who you haven’t seen in five months. Dewey Kerrigan is blossoming girl who is finally going to live with her dad, Jimmy Kerrigan at Los Almos (The Hill). He has been doing war work for the five months. Her mother left when she was an infant. 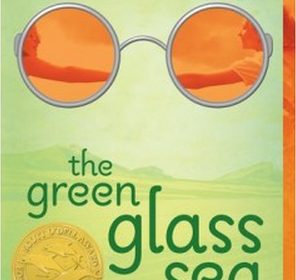 Ellen Klages’s book The Green Glass Sea brings readers through the exciting adventures of Dewey Kerrigan’s upbeat and sorrowful times during the 1940s. On the hill everything is secret, working late nights and early mornings Jimmy rarely sees his own child. The scientists in the labs, such as Jimmy, on the hill are building a gadget. None of the scientists can talk about the gadget at home, because it is top secret. Nobody can get into the hill without a pass and everyone knows everyone, there are no strangers on the hill. “ She and Papa knew just about everyone who lived here, and no strangers could get in from the outside.” In a twisted turn of events Dewey must stay with a girl named Suze, and her parents Terry and Philip Gordon because Dewey’s dad had to leave for a few months. Suze does not like Dewey because at recess all she does is work on a contraption of her own. Ellen Klages has written out her characters so that readers can relate to them. For example her character. Dewey is a girl who most people who have been disliked and bullied can relate to because of the other girls in the book. You could say Dewey is a tomboy, she loves building things, adventuring and especially going to the dump. She loves going to the dump because the scientists throw away old parts that she can use for her own inventions. People who enjoy science fiction books would love this novel. Personally I believe that the life lesson of the book is “don’t judge a book by its cover” this is because in the beginning of the book Suze thinks Dewey is weird because all she did at recess was work on a gizmo by herself and not play with anyone. Once Suze got to know Dewey she figured shes not that strange after all. Also all the other girls called Suze the “truck” because she was a little on the heavy side but, if the girls actually knew her, they wouldn’t call her that. They wouldn’t call her that because it’s what’s on the inside that counts and not on the out.